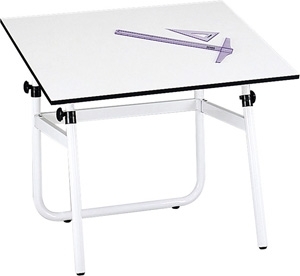 The Horizon table folds down to just 6-5/8" wide for compact storage. The base adjusts from 29" to 45" high. The top tilts up to 50 degrees with easy access knobs. 48" x 36" (Model 3951) white melamine top. Top is 3/4" in thickness. Durable white finish. Minor assembly required.